Fed Chair Janet Yellen delivered her first public remarks to the US House Financial-Services Committee. Meanwhile, non-profit group Better Markets has challenged the constitutionality of the $13 billion JPMorgan Chase mortgage settlement with the US DoJ. And in Washington, Republican leaders in the House of Reps agreed to advance legislation, raising Washington's borrowing authority without conditions. Erin Ade reports. Then, economist Paul Craig Roberts, a former assistant secretary at the Treasury and a co-founder of Reaganomics. 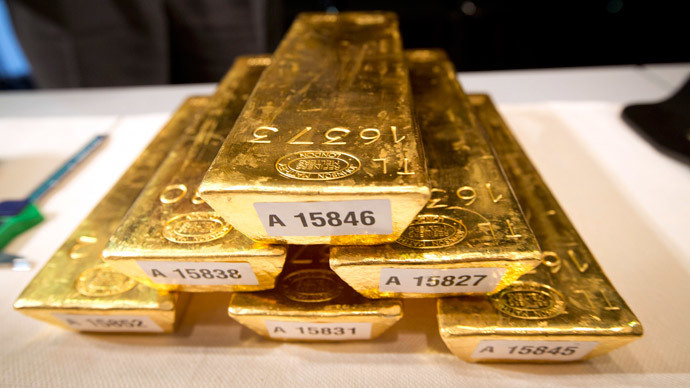 He speculates that, as the German Bundesbank has begun repatriating its gold from overseas out of storage in places like the Federal Reserve, the Fed will not be able to make delivery because it doesn’t physically possess the gold. In Big Deal, Erin and Edward Harrison discuss the outlawing of bitcoin wallet apps on iOS, Apple’s mobile platform, and the rise of ePayments in the mobile world.